I think its’s so interesting how a change of lifestyle/schedule can alter your personal style. I was reflecting back on how my style has changed in the last couple years and realized how drastic (well, from my point of view) it was. Before, I wore uniforms five days a week so when I had the chance to pick out my own clothes I threw my efforts into it. 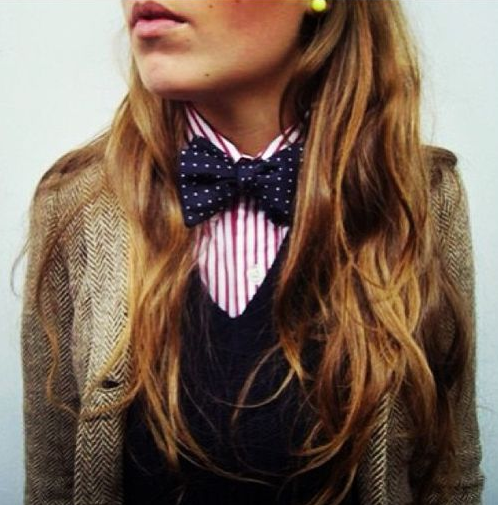 My style was a lot like J.Crew’s at the time, a lot of button ups, ties, cardigans, and layering. Now, I pick out my own clothes everyday, and when it’s early in the morning all I want is comfort. When I’m half asleep, an oxford is far from the first thing I reach for. I now wear a lot more cozy tees, jeans, tennis shoes, and loose sweaters. I kind of miss the good old days when the effort to think through an outfit was more present in my life. P.S. Style Not Trend got a Pinterest! For more regular updates, go follow here.